The effect of geomagnetic storms on the mid-high latitude F2 region is studied. For this purpose, foF2 data from four Antarctic stations were analyzed during three intense magnetic storms occurred in high solar activity (years 2002 and 2003). In general, negative storm effects irrespective of the local time were observed during the first part of the storms (main phase). Negative effects were also observed more often than positive effects during the first part of the recovery phase, which seems to indicate almost no longitudinal dependence in this stage of the storm. The negative effects frequently changed to positive during the last stage of the recovery. Several physical mechanisms were operative during the different stages of the storms. Keywords: Geomagnetic storms, Ionosphere, Mid-high latitudes, Antartic, Thermospheric, Meridional. © 2017 Gustavo A. Mansilla. A geomagnetic storm is a major disturbance of Earth´s magnetosphere, which occurs when there is a very efficient exchange of energy from the solar wind into the space environment surrounding the Earth [1Danilov AD. Ionospheric F-region response to geomagnetic disturbances. Adv Space Res 2013; 52: 343-66. It is well known that the terrestrial ionosphere is significantly disturbed during geomagnetic storms, which are called ionospheric storms. The impact of magnetic storms on the ionosphere has been studied for nearly 100 years and now the morphology of the ionospheric storms are rather well known, being the dominant mechanisms responsible for them identified and modeled [1Danilov AD. Ionospheric F-region response to geomagnetic disturbances. Adv Space Res 2013; 52: 343-66. [http://dx.doi.org/10.1016/j.asr.2013.04.019] -5Danilov AD. F2-region response to geomagnetic disturbances. J Atmos Sol Terr Phys 2001; 63: 441-9. [http://dx.doi.org/10.1016/S1364-6826(00)00175-9] ]. During storm conditions the electron concentration can either increase or decrease relative to a “normal” level, which are termed as positive or negative storm effects or positive or negative phases of the storm, respectively. To explain the electron density disturbances during storms several physical mechanisms have been suggested as the possible causes: intensified electric fields, thermospheric meridional winds, “composition bulge”, among others [6Mansilla GA. Mid-latitude ionospheric effects of a great geomagnetic storm. J Atmos Sol Terr Phys 2001; 66: 1085-91. The critical frequency of the F2-layer (foF2) is a very important parameter to study the ionospheric behavior both in quiet and disturbed conditions because it gives a direct measure of the peak electron density NmF2, which is a parameter of vital importance in the radio wave communication. Some studies performed with foF2 at high and subauroral latitudes in the Northern Hemisphere have found negative storm effects almost always during the main phase and recovery phase of geomagnetic storms [7Prölss GW, Brace LH, Mayr HG, Carignan GR, Killeen TL, Klobuchar JA. Ionospheric storm effects at subauroral latitudes: A case study. J Geophys Res 1991; 96: 1275-88. [http://dx.doi.org/10.1029/90JA02326] , 8Kane RP. Ionospheric foF2 anomalies during some intense geomagnetic storms. Ann Geophys 2005; 23: 2487-99. It was observed that reduction of foF2 is greatest during the early morning hours, in summer, at higher geomagnetic latitudes, near solar minimum and through the more active periods [9Wrenn GL, Rodger AS, Rishbeth H. Geomagnetic storms in the Antarctic F region: I. Diurnal and seasonal patterns for main phase effects. J Atmos Terr Phys 1987; 49: 901-14. [http://dx.doi.org/10.1016/0021-9169(87)90004-3] ]. In winter at high latitudes of the Southern Hemisphere NmF2 usually is increased as the result of a geomagnetic storm whereas in the Northern Hemisphere it is depressed; in summer, both hemispheres normally presented reduced values of NmF2 as a result of storm activity [10Rodger AS, Wrenn GL, Rishbeth H. Geomagnetic storms in the Antarctic F region: II Physical interpretation. J Atmos Terr Phys 1989; 51: 851-66. Studies of the Total Electron Content (TEC) obtained from the Global Positioning System (GPS) data have been also made. Thus for example, increases in TEC at high latitudes of the Northern Hemisphere during some storms occurred in 1997 were observed [11Aarons J, Lin B, Mendillo M, Liou K, Codrescu M. Global Positioning System phase fluctuations and ultraviolet images from the Polar satellite. J Geophys Res 2000; 105: 5201-13. A study of the effects of an intense geomagnetic storm on the Southern Hemisphere ionosphere using ground-based and satellite measurements (TEC obtained from GPS signals, ionosonde data, and data from satellite in-situ measurements revealed positive disturbances at high- and mid-latitudes during the storm main phase, followed by long lasting negative storm effects during the recovery phase [12Yizengaw E, Dyson PL, Essex EA, Moldwin MB. Ionosphere dynamics over the Southern Hemisphere during the 31 March 2001 severe magnetic storm using multi-instrument measurement data. Ann Geophys 2005; 23: 707-21. The majority of GPS receivers for ionospheric studies are situated in the North Hemisphere, that is, there is a relatively small quantity of GPS receivers in the Southern Hemisphere and smaller still at the high latitudes of this hemisphere. For that reason, there are available limited TEC measurements and therefore a small number of studies. An exhaustive study of TEC disturbance patterns during 180 geomagnetic storms to describe seasonal and solar cycle effects at different latitudes was performed [4Mendillo M. Storms in the ionosphere: Patterns and processes for total electron content, RUGEO 2006; 44: RG4001, Paper number 2005RG000193 2006.]. Case studies in which are analyzed the ionospheric storm effects based on the variations of foF2 or TEC at several stations of one particular region are useful because they permit to analyze the morphology and the role of the various physical mechanisms acting during the storms. Majority of the papers in the published literature describes the morphology of the Arctic ionosphere during all the stages of the storms by using foF2 and/or TEC data. Because the Antarctic sector has been less studied than Arctic sector, this paper presents a study of the foF2 disturbances above four Antarctic stations during some intense geomagnetic storms. A preliminary study with ionospheric parameters from an Argentine Antarctic station during geomagnetic storms occurred in 2000 and 2001 has been already made [13Mansilla GA, Zossi MM. Some ionospheric storm effects at an Antarctic station. Adv Space Res 2016; 57: 1319-27. [http://dx.doi.org/10.1016/j.asr.2015.05.028] ]. In general negative storms effects were observed following the sudden commencements of the storms. The results presented in the present study are more extensive because they were obtained by using ionospheric data from four stations located at different latitudes and in different longitudinal sectors. They help us to describe better the morphology of the high latitude ionosphere in the Southern Hemisphere during geomagnetic storms. An analysis of the diurnal and seasonal variations of the critical frequency foF2 and the Total Electron Content during quiet magnetic conditions at the Argentine and Chilean Antarctic region have been made [14Mosert M, McKinnell LA, Gende M, et al. Variations of foF2 and GPS total electron content over the Antarctic sector. Earth Planets Space 2011; 63: 327-33. [http://dx.doi.org/10.5047/eps.2011.01.006] ]. This study shows a daily peak of foF2 around local noon in winter and fall, and in spring a secondary peak around midnight. Also, in summer (January) foF2 reaches its minimum value around the noon sector while the maximum in the diurnal variation of foF2 is located in a time sector close to midnight. The TEC measurements showed similar variation to those observed in the foF2 values. The locations of the ionospheric stations used (Macquarie Is. and Syowa, auroral stations; Casey, polar station and Base Gral. San Martin, subauroral station) are listed in (Table 1). Three intense geomagnetic storms were considered, which occurred on August 18, 2002 at 1846 UT (storm 1), on September 30, 2002 at 0815 UT (storm 2) and on August 17, 2003 at 1421 UT (storm 3), when the solar activity was moderately high. The intense storms are subdivided to strong (-200 ≤ Dstmin ≤-100 nT), very strong (-300 ≤ Dstmin ≤-200 nT) and great (Dstmin ≤-350 nT), Dstmin being the peak (maximal by the magnitude) negative value of Dst [15Gonzalez WD, Tsurutani BT, Gonzalez AL. Interplanetary origin of geomagnetic storms. Space Sci Rev 1999; 88: 529-62. Hourly values of Dst and AE indices were obtained from the World Data Center (WDC) Kyoto, Japan website (http://swdc.kugi.kyoto-u.ac.jp/dstdir). 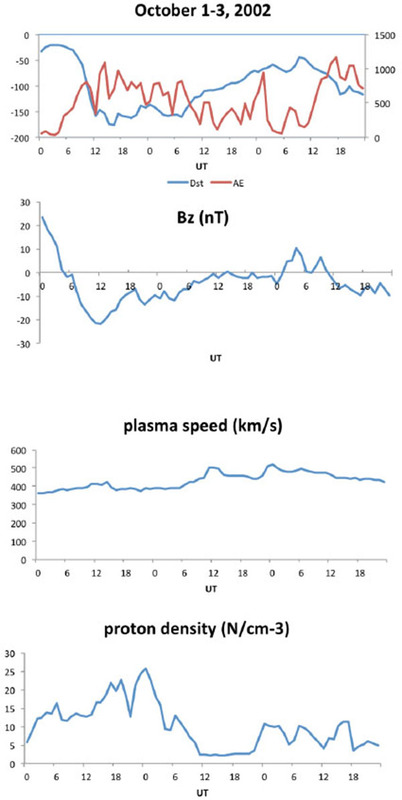 Bz component of the Interplanetary Magnetic Field, plasma speed and proton density data were obtained of the Goddard Space Flight Center OMNIWeb (https://omniweb.gsfc.nasa.gov/form/dx1.html). At high latitudes all ionosondes are subject to several rather severe limitations during magnetic storms and sub-storms and associated auroral and polar absorption, auroral events, spread F conditions and sporadic E layer effects, which can produce a blanketing of the signal trace. Another problem was the difficulty to find simultaneous intervals of foF2 values measured at the different stations [14Mosert M, McKinnell LA, Gende M, et al. Variations of foF2 and GPS total electron content over the Antarctic sector. Earth Planets Space 2011; 63: 327-33. [http://dx.doi.org/10.5047/eps.2011.01.006] ]. For our analysis, some storm periods with a reasonable amount of foF2 data were found. where foF2 is the hourly perturbed critical frequency and foF2(m) represents the monthly median. Although the monthly median value is used in this study can be not considered to be representative of quiet conditions especially during sunspot maximum when more that 15 days in a month can be at least moderately geomagnetically active, their use reproduce the main characteristics of ionospheric storms similarly to the use of a quiet day as “control” day. Geomagnetic/solar activity for the storm period August 18-24, 2002 as indicated by the Dst and AE indices and the Bz component of the interplanetary magnetic field, the solar wind speed and the proton density, respectively. The existence of so called “dead zones” [5Danilov AD. F2-region response to geomagnetic disturbances. J Atmos Sol Terr Phys 2001; 63: 441-9. [http://dx.doi.org/10.1016/S1364-6826(00)00175-9] , 16Danilov AD, Belik LD. Thermospheric-ionospheric interaction during ionospheric storms. Geomagn. Aeron. 1991 (in Russian) 1991; 31(2): 209. ], when in the middle of a storm for several hours the deviation from the median does not exceed 10% was not analyzed in this study. Fig. (1 ) presents the solar/geomagnetic parameters for the storm period August 18-24, 2002 (storm 1). From the top to the bottom, the panels show the Dst and AE geomagnetic indices, the Bz component of the Interplanetary Magnetic Field (IMF), the solar wind speed vs and the proton density Np. The Figure shows an irregular main phase with substorms till about 05 UT on August 21 (Dst minimum= - 105 nT) when starts the recovery. At least four substorms in AE index (with values higher than 1000 nT) there were from 18 UT on 18 August to 05 UT on 21 August during the main phase and recovery phase. Bz component started fluctuating but pointed southward several hours during the end of the main phase, from about 16 UT on August 20 to 13 UT on August 21, and then turned northward (positive). The solar wind speed vs and the proton density Np abruptly increased from about 400 to 600 km/s and from 4 to 14 cm-3 at 19-20 UT on the storm day, both decaying during the main phase. A second enhancement was observed in Np during the recovery phase, between about 0 UT and 12 UT on August 22. Fig. (2 ) illustrates the variations of DfoF2 at Macquarie Is., Casey and Syowa for the same period that Fig. (1 ). No data were available for the station Base San Martin. Vertical dashed lines indicate the storm onset and the end of the main phase. Local noon for Macquarie Is., Casey, Syowa and Base Gral. San Martín were at 01 UT, 05 UT, 10 UT and 19 UT respectively. Positive storm effects with amplitudes of up to 60-80% were observed at Casey and Syowa prior to the storm onset at all the stations while Macquarie Is showed negative DfoF2 of ~ 40% magnitude before the storm onset. During the main phase irregular negative disturbances were observed over the stations Macquarie Is and Casey. The available data at Syowa also suggests a negative storm effect. During the recovery phase, positive disturbances with peaks higher than 40% were observed at all stations in the evening-midnight hours. Ionospheric storm effects observed during August 18-24, 2002 at the stations Macquarie Is., Casey and Syowa. The relative deviation of the critical frequency foF2 from the monthly median at each station, DfoF2, is used to describe the perturbations. Dashed lines indicate the storm onset and the end of the main phase. For storms 2 and 3, the Dst index started to decrease the following day after the storm commencement, that is, on October 1, 2002 at about 04 UT and on August 18, 2003 at about 01 UT respectively. No significantly disturbances in foF2 were observed the days of the storm onset. For that reason, the ionospheric behavior on the storm day is not shown and it is presented from the main phase of the storms. Fig. (3 ) is similar to Fig. (1 ), but for the storm period October 1-3, 2002 (storm 2). The Dst decrease began about 04 UT on October 1, indicating the start of the storm main phase and reached its minimum value (- 176 nT) at 15 UT when began a recovery stage until 10 UT on October 3. The AE index abruptly increased since storm commencement, and it persisted enhanced on October 2 (during the recovery phase). The IMF Bz component turned negative (southward) from about 06 UT on October 1 to 12 UT on the following day, and practically zero during several hours after that. The long duration of Bz in southward direction indicated magnetic reconnection for a significant length of time. The solar wind speed vs remained between 400 and 500 km/s during throughout storm period. The proton density increased from about 11 to 25 cm-3 since about the storm commencement to the recovery phase (≈ 07 UT on October 2). Geomagnetic/solar activity for the storm period October 1-3, 2002 as indicated by the Dst and AE indexes and the Bz component of the interplanetary magnetic field, the solar wind speed and the proton density, respectively. Fig. (4 ) shows the ionospheric response for the October 1-3, 2002 storm period (storm 2). In response to the storm, negative deviations of DfoF2 were observed at Casey and Syowa during the main phase. At Casey the disturbance changed to positive in the nighttime hours, during the first stage of the recovery (from 15 UT to 20 UT on October 1), followed by a fluctuating variation. At Macquarie Is. and Syowa negative DfoF2 values of irregular amplitude (up to 60%) were observed during the first stage of the recovery phase. Only three stations presented positive disturbances during the last part of the recovery (at Casey, in the evening-post midnight hours). The station Base Gral. San Martín did not demonstrate any prominent positive disturbance in foF2. 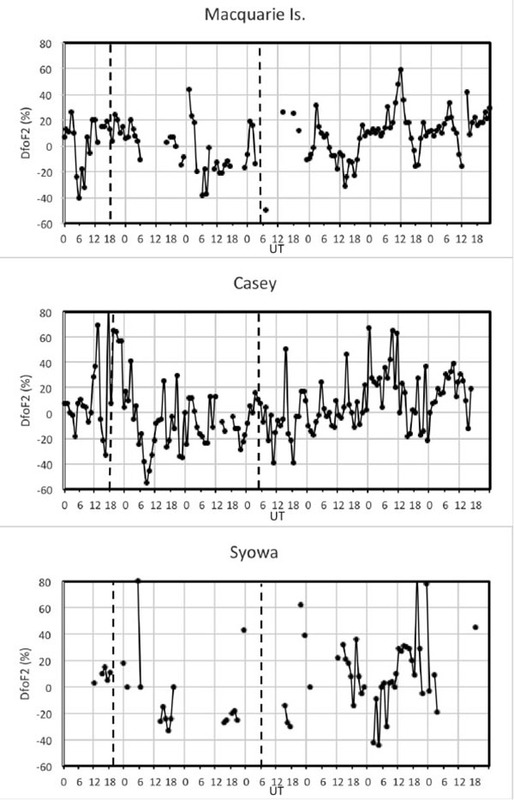 Ionospheric storm effects observed during October 1-3, 2002 at the stations Macquarie Is., Casey, Syowa and Base Gral. San Martín. The relative deviation of the critical frequency foF2 from the monthly median at each station, DfoF2, is used to describe the perturbations. Dashed line represents the end of the main phase. Fig. (5 ) presents the magnetic/solar wind parameters for the August 18-24, 2003 storm period (storm 3). The minimum in Dst (- 148 nT) was at 15 UT on August 18 and a regular recovery last approximately 48 hours, on August 19-20. The index AE was increased during the main phase and first stage of the recovery, after which there was a drop during several hours (≈ 18 hours) and about 0 UT on August 20 AE started to increase again. The IMF Bz component was in southward direction since the main phase till about 02 UT on August 19 (indicative of a strong magnetic reconnection for a significant length of time), when rotated to northward for about 24 h. The solar wind speed started to increase almost coincident with the second AE enhancement, from about 440 to more than 700 km/s and it remained so the same time that the AE enhancement. The solar wind proton density started fluctuating with small values during the main phase-first stage of the recovery, increasing from about 4 to 14 cm-3 during the second AE enhancement. Geomagnetic/solar activity for the storm period August 18-24, 2003 as indicated by the Dst and AE indexes and the Bz component of the interplanetary magnetic field, the solar wind speed and the proton density, respectively. Fig. (6 ) illustrates the ionospheric behavior at the Antarctic stations for the same storm period that Fig. (5 ). A negative storm effect can be clearly seen at Casey during the main phase above all the stations. Macquarie Is., with practically no data during the main phase, presented negative DfoF2 values during almost entire recovery phase, except a short duration positive storm effect around the midnight on August 20. Large positive variations of foF2 at the polar station Casey were observed around midnight from August 20. At the subauroral station Base Gral. San Martin, positive variations in foF2 with peaks around noon were observed in the morning to evening hours from August 19. Ionospheric storm effects observed during August 18-24, 2003 at the stations Macquarie Is., Casey, Syowa and Base Gral. San Martín. The relative deviation of the critical frequency foF2 from the monthly median at each station, DfoF2, is used to describe the perturbations. Dashed line represents the end of the main phase. In this paper, hourly foF2 measurements from four Antarctic stations were used to study the ionospheric features during the periods of three intense geomagnetic storms occurred in 2002 and 2003 i.e. high solar activity. In general, negative storm effects were observed during the main phase of the storms. Negative effects were also observed more often than positive storm effects during the first part of the recovery phase. The maximal DfoF2 (positive effects) were observed mainly in the evening-after midnight hours, while the minimal DfoF2 (negative effects) were observed mainly in the noon-afternoon hours. The negative effects may change to positive during the last stage of the recovery. In this stage of the storm the ionospheric response seems be mostly different in the different locations. The nature of this dependence is possibly determined by the disagreement between geographic coordinate system to which distribution of the neutral atmosphere parameters and solar radiation are related and the geomagnetic system, where the distribution of magnetosphere sources is regulated. Sometimes, pre-storm positive effects can be also observed. The results observed during the main phase and the first part of the recovery are in agreement with previous observations [7Prölss GW, Brace LH, Mayr HG, Carignan GR, Killeen TL, Klobuchar JA. Ionospheric storm effects at subauroral latitudes: A case study. J Geophys Res 1991; 96: 1275-88. [http://dx.doi.org/10.5194/angeo-23-2487-2005] , 10Rodger AS, Wrenn GL, Rishbeth H. Geomagnetic storms in the Antarctic F region: II Physical interpretation. J Atmos Terr Phys 1989; 51: 851-66. [http://dx.doi.org/10.1016/0021-9169(89)90002-0] , 12Yizengaw E, Dyson PL, Essex EA, Moldwin MB. Ionosphere dynamics over the Southern Hemisphere during the 31 March 2001 severe magnetic storm using multi-instrument measurement data. Ann Geophys 2005; 23: 707-21. Positive disturbances sometimes have been observed before the beginning of the magnetic disturbances at high latitudes [8Kane RP. Ionospheric foF2 anomalies during some intense geomagnetic storms. Ann Geophys 2005; 23: 2487-99. [http://dx.doi.org/10.5194/angeo-23-2487-2005] , 17Blagoveschensky DV, MacDougall JW, Piatkova AV. Ionospheric effects preceding the October, 2003, Halloween storm. J Atmos Sol Terr Phys 2006; 68: 821-31. [http://dx.doi.org/10.1016/j.jastp.2005.10.017] , 18Buresova D, Lastovicka J. Pre-enhancements of foF2 above Europe. Adv Space Res 2007; 39: 1298-303. [http://dx.doi.org/10.1016/j.asr.2007.03.003] ]. Several main drivers of the pre-storm enhancements have been suggested, which are: solar flares (they can only occasionally strengthen the pre- storm enhancements), soft particle precipitation in dayside cusp, magnetospheric electric field penetration, and auroral region activity expressed via the AE index. The latter mechanism could be the potential cause of the significant positive effect prior to storm given the increase observed in AE. Because the pre-storm enhancements of electron density have been very few studied and therefore their origin remains to be uncovered, further research is needed. Respect to the negative storm effects, possibly different physical mechanisms were operative in the different stages of the storms. The nearly simultaneous negative storm effect at several stations, which occur few after the storm onset require a fairly rapid mechanism such as an electrodynamic one. So, we think that electric fields effects were pronounced in certain longitude sectors. Strong storm time electric fields are observed in polar and high latitude regions in the zone of Joule heating mainly. Due to the magnetic field geometry, they do not produce vertical drifts as at low latitudes, but they are able to influence the F2-region behavior via the recombination coefficient [13Mansilla GA, Zossi MM. Some ionospheric storm effects at an Antarctic station. Adv Space Res 2016; 57: 1319-27. [http://dx.doi.org/10.1016/j.asr.2015.05.028] ]. The rate of the O+ + N2 reaction, which provide an important reaction in the loss of ionization, depends strongly on the electric field, and thus an increase of the field should lead to a negative effect [19Schunk RW, Raitt WJ, Banks PM. Effects of electric fields on the daytime high-latitude E and F regions. J Geophys Res 1975; 80: 3121-30. [http://dx.doi.org/10.1029/JA080i022p03121] , 20Danilov AD, Lastovicka J. Effects of geomagnetic storms on the ionosphere and atmosphere. Int J of Geomag and Aero 2001; 2: 209-24.]. Some authors believe that another possibility for the enhanced ion loss could be related with elevated ion temperatures and vibrationally excited N2 molecules caused by frictional heating in regions of rapid ion convection, which is produced by strong electric fields [21Pavlov AV. The role of vibrationally excited nitrogen in the formation of the mid-latitude negative ionospheric storms. Ann Geophys 1994; 12: 554-64. [http://dx.doi.org/10.1007/s00585-994-0554-x] , 22Pavlov AV, Buonsanto MJ. Comparison of model electron densities and temperatures with Millstone Hill observations during undisturbed period and the geomagnetic storms of 16-23 March and 6-12 April 1990. Ann Geophys 1997; 15: 327-44. [http://dx.doi.org/10.1007/s00585-997-0327-4] ]. However, many case studies explain the main features of many storms are successfully explained without any assumption on the temperature increase. There is no doubt that a change of composition (especially increase in molecular oxygen or nitrogen and decrease in atomic oxygen) is an important factor in the depletion of ionization. The disturbances of thermospheric composition result from changes in the thermosphere global circulation caused by high-latitude energy inputs (Joule heating and particle precipitation) during magnetically disturbed periods. Because at high latitudes the molecular species are enhanced, the loss rate of ions is increased, contributing thus to decreases of electron density. If the storm heating is sufficiently intense and long lasting as occurs during intense geomagnetic storms, the negative effects are prolonged as observed in these case studies. Furthermore, the interaction of background (solar-driven) and storm-induced thermospheric circulation systems possibly play also an important role. In winter, the background thermospheric circulation is directed poleward and it is opposite to the storm-induced circulation. That leads to a “stopping” of the negative storm effects, thus being confined to high and mid-high latitudes. The storm-time winds also can produce positive disturbances as at Casey between pre-evening hours and after midnight on October 1, during the recovery phase of storm 2. The enhanced equatorward neutral wind lifts the ionization to regions of lower loss during the daytime when production is still occurring. The rise in the virtual height h´F observed at Casey Fig. (7 ) to regions of reduced loss seems to confirm that mechanism. The h´F data for the other stations are not shown because there are gaps of data. 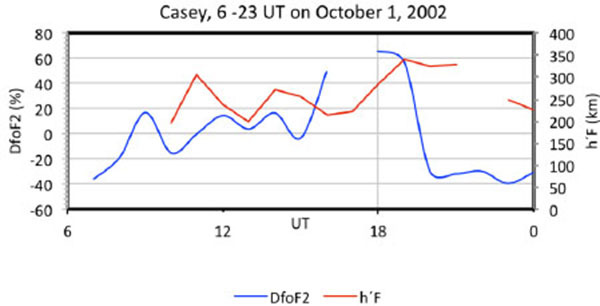 Temporal variation of DfoF2 and of the virtual height h´F at Casey from 06 to 23 UT on October 1, 2002 (storm 2). Note the uplifting of the F layer and the subsequent increase in foF2 (positive storm). Positive storm effects, occurring later in the storm, have been frequently observed at low latitudes. They have been attributed to decreases in mean molecular mass, caused by a downwelling in the recovery phase, resulting in diminished loss rates and an effective increase in plasma production [23Fuller-Rowell TW, Codrescu MV, Moffett RJ, Quegan S. Response of the thermosphere and ionosphere to geomagnetic storms. J Geophys Res 1994; 99: 3893-914. [http://dx.doi.org/10.1029/93JA02015] , 24Szuszczewics EP, Lester M, Wilkinson P, et al. A comparative study of global ionospheric responses to intense magnetic storm conditions. J Geophys Res 1988; 103: 11,665-84. The composition changes are possibly also the primary cause of delayed positive effects occurring at high latitudes during the recovery. 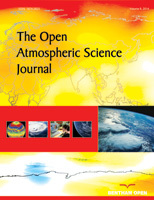 With DE-2 satellite data at F2-region heights, significant increases of atomic oxygen density were observed at mid-high latitudes, while molecular nitrogen concentration remained with no changes [25Mansilla GA. Thermosphere–ionosphere response at middle and high latitudes during perturbed conditions: A case study. J Atmos Sol Terr Phys 2008; 70: 1448-54. [http://dx.doi.org/10.1016/j.jastp.2008.04.011] ]. The enhanced oxygen density affects the ionization production, leading to increases in the electron density. It is reasonable to presume that no significant change is produced in the storm-time F region height at high latitudes during enhanced recombination processes. Fig. (8 ) shows the positive storm effect at Syowa for the period 23-24 August 2002 (recovery phase of storm 1) and superimposed the virtual height h´F during quiet and disturbed conditions. It can be seen no significant change in the virtual height in association with the positive storm effect. For that reason it is proposed that the mechanism could be important to produce the delayed increases of electron density. Although plausible, this interpretation needs further confirmation by other observations. Temporal variations of DfoF2, disturbed and quiet h´F values at Syowa for the period August 23-24, 2002 (storm 1). Observe the positive storm effect from 11 to 00 UT on August 23 (~ 13 – 02 LT) and no considerable change in the virtual height. Coordinates of the stations used in this analysis. It is well known the strong influence of the of the IMF Bz component on ionospheric electric fields in the high latitude region [26Nishida A. Coherence of geomagnetic DP 2 fluctuations with interplanetary magnetic variations. J Geophys Res 1968; 73: 5549-59. During southward periods of IMF Bz magnetospheric electric fields can penetrate to the ionosphere [27Wang W, Lei J, Burns AG, et al. Ionospheric response to the initial phase of geomagnetic storm: Common features. J Geophys Res 2010; 115: A07321. [http://dx.doi.org/10.1029/2009JA014461] ]. These penetration electric fields can have a significant impact on ionospheric densities [28Lei J, Wang W, Burns AG, et al. Observations and simulations of the ionospheric and thermospheric response to the December 2006 geomagnetic storm: Initial phase. J Geophys Res 2008; 113: A01314. Because several hours are required for the generation of the storm-induced global thermospheric circulation as result of the pressure gradient (caused by precipitation of high energetic particles and by neutralized ring current particles) in the high latitude region and the propagation toward lower latitudes, it is suggested that the initial negative storm effects in the Antarctic sector were produced, direct or indirectly, by an enhanced electric field. The upper atmosphere composition changes produced during the storm development, promote and/or substitute the initial effect of an electric field. The composition perturbations intensify and expand, thus leading to a general depletion of the high latitude electron density. In summary, this paper presents the study of ionosonde data from some Antarctic stations during three storm events. Also the physical explanation of the changes of the critical frequency of the F2 layer is made. Several physical mechanisms with a relative importance depending of the stage of the storm seem to be operative during the storms. There is a classical picture of the ionospheric storms at mid-high and high latitudes, which point that negative storm effects are predominantly observed throughout storm period without bias in LT [8Kane RP. Ionospheric foF2 anomalies during some intense geomagnetic storms. Ann Geophys 2005; 23: 2487-99. [http://dx.doi.org/10.5194/angeo-23-2487-2005] , 24Szuszczewics EP, Lester M, Wilkinson P, et al. A comparative study of global ionospheric responses to intense magnetic storm conditions. J Geophys Res 1988; 103: 11,665-84. [http://dx.doi.org/10.1029/97JA01660] ]. The present study shows that the above pattern is not always valid because significant positive storm effects can be observed during the recovery phase at stations separated by about 120 degrees in longitude. Although limited, the results obtained here permit to improve the knowledge about the morphology in this remote region of the Southern Hemisphere. However, it is obvious that more studies are necessary to give more precise information on the morphology and physical mechanisms of the ionospheric storms in the Antarctic sector. Danilov AD. Ionospheric F-region response to geomagnetic disturbances. Adv Space Res 2013; 52: 343-66. Prölss GW. Ionospheric F-region storms; Handbook of Atmospheric Electrodynamics. Boca Raton: Press 1995; Vol. 2: pp. 195-248. Bounsanto MJ. Ionospheric storms - A review. Space Sci Rev 1999; 88: 563-601. Mendillo M. Storms in the ionosphere: Patterns and processes for total electron content, RUGEO 2006; 44: RG4001, Paper number 2005RG000193 2006. Danilov AD. F2-region response to geomagnetic disturbances. J Atmos Sol Terr Phys 2001; 63: 441-9. Mansilla GA. Mid-latitude ionospheric effects of a great geomagnetic storm. J Atmos Sol Terr Phys 2001; 66: 1085-91. Prölss GW, Brace LH, Mayr HG, Carignan GR, Killeen TL, Klobuchar JA. Ionospheric storm effects at subauroral latitudes: A case study. J Geophys Res 1991; 96: 1275-88. Kane RP. Ionospheric foF2 anomalies during some intense geomagnetic storms. Ann Geophys 2005; 23: 2487-99. Wrenn GL, Rodger AS, Rishbeth H. Geomagnetic storms in the Antarctic F region: I. Diurnal and seasonal patterns for main phase effects. J Atmos Terr Phys 1987; 49: 901-14. Rodger AS, Wrenn GL, Rishbeth H. Geomagnetic storms in the Antarctic F region: II Physical interpretation. J Atmos Terr Phys 1989; 51: 851-66. Aarons J, Lin B, Mendillo M, Liou K, Codrescu M. Global Positioning System phase fluctuations and ultraviolet images from the Polar satellite. J Geophys Res 2000; 105: 5201-13. Yizengaw E, Dyson PL, Essex EA, Moldwin MB. Ionosphere dynamics over the Southern Hemisphere during the 31 March 2001 severe magnetic storm using multi-instrument measurement data. Ann Geophys 2005; 23: 707-21. Mansilla GA, Zossi MM. Some ionospheric storm effects at an Antarctic station. Adv Space Res 2016; 57: 1319-27. Mosert M, McKinnell LA, Gende M, et al. Variations of foF2 and GPS total electron content over the Antarctic sector. Earth Planets Space 2011; 63: 327-33. Gonzalez WD, Tsurutani BT, Gonzalez AL. Interplanetary origin of geomagnetic storms. Space Sci Rev 1999; 88: 529-62. Danilov AD, Belik LD. Thermospheric-ionospheric interaction during ionospheric storms. Geomagn. Aeron. 1991 (in Russian) 1991; 31(2): 209. Blagoveschensky DV, MacDougall JW, Piatkova AV. Ionospheric effects preceding the October, 2003, Halloween storm. J Atmos Sol Terr Phys 2006; 68: 821-31. Buresova D, Lastovicka J. Pre-enhancements of foF2 above Europe. Adv Space Res 2007; 39: 1298-303. Schunk RW, Raitt WJ, Banks PM. Effects of electric fields on the daytime high-latitude E and F regions. J Geophys Res 1975; 80: 3121-30. Danilov AD, Lastovicka J. Effects of geomagnetic storms on the ionosphere and atmosphere. Int J of Geomag and Aero 2001; 2: 209-24. Pavlov AV. The role of vibrationally excited nitrogen in the formation of the mid-latitude negative ionospheric storms. Ann Geophys 1994; 12: 554-64. Pavlov AV, Buonsanto MJ. Comparison of model electron densities and temperatures with Millstone Hill observations during undisturbed period and the geomagnetic storms of 16-23 March and 6-12 April 1990. Ann Geophys 1997; 15: 327-44. Fuller-Rowell TW, Codrescu MV, Moffett RJ, Quegan S. Response of the thermosphere and ionosphere to geomagnetic storms. J Geophys Res 1994; 99: 3893-914. Szuszczewics EP, Lester M, Wilkinson P, et al. A comparative study of global ionospheric responses to intense magnetic storm conditions. J Geophys Res 1988; 103: 11,665-84. Mansilla GA. Thermosphere–ionosphere response at middle and high latitudes during perturbed conditions: A case study. J Atmos Sol Terr Phys 2008; 70: 1448-54. Nishida A. Coherence of geomagnetic DP 2 fluctuations with interplanetary magnetic variations. J Geophys Res 1968; 73: 5549-59. Wang W, Lei J, Burns AG, et al. Ionospheric response to the initial phase of geomagnetic storm: Common features. J Geophys Res 2010; 115: A07321. Lei J, Wang W, Burns AG, et al. Observations and simulations of the ionospheric and thermospheric response to the December 2006 geomagnetic storm: Initial phase. J Geophys Res 2008; 113: A01314.